Jackye Carroll of Pass Christian, Mississippi has loved fiddle leaf fig plants for most of her life. She was one of the first people to embrace a fiddle leaf fig tree when she bought her original plant for her first apartment in 1970. She adored it for 35 years, until Hurricane Katrina took all of her prized plants along with her home. 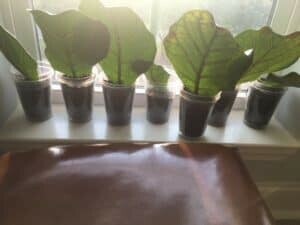 She was heartbroken to lose her beloved plants, but she didn’t lose her passion for growing and fiddle leaf fig propagation. 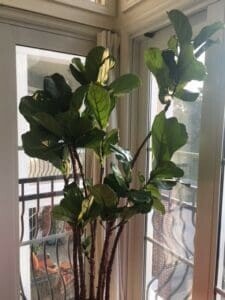 As soon as she purchased a new condo after the hurricane, she started raising fiddle leaf figs again. When she began growing her herd, she thought propagation would be a good way to get several plants from the cuttings of a few plants. Four months later, she has nearly 60 new fiddle leaf fig plants propagated from a group of eight mother plants. But not all of her cuttings successfully rooted and only a small percentage have few sprouted leaves. 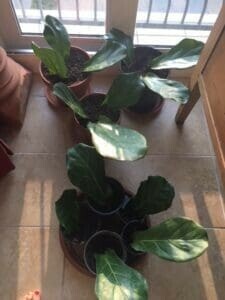 Here’s what she learned about successfully propagating fiddle leaf fig plants. 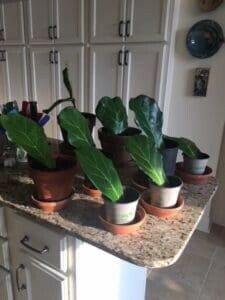 Several successful new fiddle leaf fig plants from propagation. A few of Carroll’s leaf cuttings that have rooted in soil. 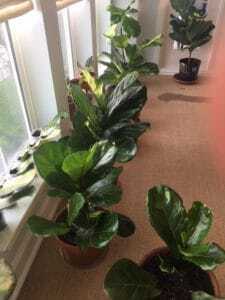 Carroll started her new fiddle leaf fig journey back in February of 2018 and by June, most of her new plants do not yet have much new growth. It takes at least four to eight weeks for new cuttings to root and up to 6 months for the newly rooted cuttings to start growing new leaves. Many growers give up and throw away their cuttings before they detect the new roots and give up on the baby plants before they have time to start putting out new leaves. But patience pays off; of the 61 cuttings she took, all but 3 produced roots. Individual leaf cuttings rooting in soil. While most of Carroll’s cuttings started growing new roots by the six week mark, there was great variability. Some had new roots at 3 or 4 weeks and some took 8 or 9. 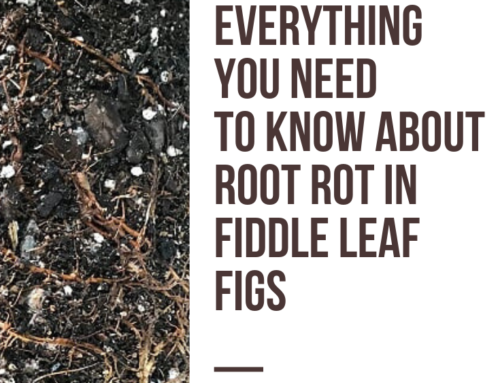 It’s important to understand that each cutting is different and the rooting process is affected by hormones, light, the time of year, and other factors. Allow at least 10 to 12 weeks before giving up on cuttings that haven’t grown roots. 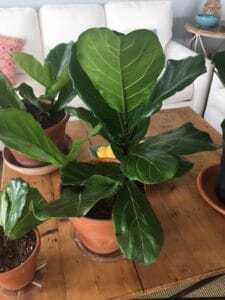 Fiddle leaf fig cuttings will root in both water or in damp soil. The growing medium doesn’t affect the success of your project, but there are some pros and cons to each. Carroll rooted some of her cuttings in both soil and water. After considering both options, she recommends rooting in soil because you eliminate the risk of breaking the fragile new roots when you put them from water to soil. However, she enjoyed seeing the new roots forming in water. 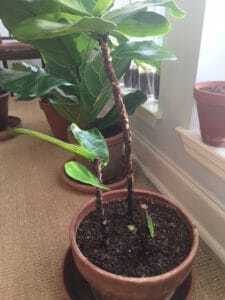 Fiddle Leaf Fig leaf cuttings rooting in soil. Whether you’re rooting your cuttings in water or soil, it’s critical to use a rooting hormone. The chemical powder signals to your plant to put its energy into making roots instead of new leaves. Without it, your chances of success are slim. Carroll used a product similar to Miracle-Gro Rooting Hormone on all of her cuttings. 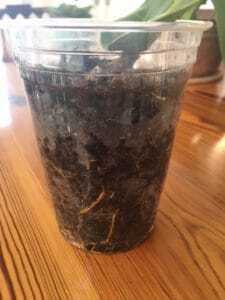 Carroll rooted her cuttings in clear plastic solo cups without any drainage holes so she could see new growth in both the soil and water rooted cuttings. She kept them evenly moist and never let them dry out. When the roots were robust, she replanted them into pots with drainage holes. One leaf cutting in soil with roots beginning to grow. After taking over 60 cuttings from her original eight plants, she was happy to see new growth including new branches on each plant. Taking cuttings for propagation does not harm the mother plant and can actually help spur new growth. One of the mother plants, sprouting new growth after pruning for propagation. Carroll noticed that after several months, the cuttings with the most new growth are the ones she took from the very top of her plants that were actively growing. These terminal branches are already programmed for new growth. Of the 8 top cuttings she took, all produced roots and new growth within 4 months. A few baby plants from top cuttings with new growth. She recommends taking a branch or growing tip anywhere from six inches to 18 inches long. Remove the leaves from the lower ⅓ or so of the branch. Dip the cut part into rooting hormone then place it into potting soil. Keep it very moist for about 6 weeks or until you see new roots. If you are pruning a long branch, you can even cut it into several sections, making sure to include a few leaves on each section. 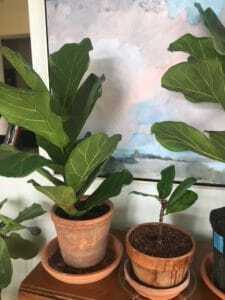 In fact, fiddle leaf figs are vigorous and resilient growers; Carroll even tested putting branches with no leaves into soil and they eventually started new growth! It just took a few more months. Surprisingly, even a branch without any leaves rooted and began growing. After about four months, Carroll now has 60 baby fiddle leaf fig plants beginning to grow. At this point, the cuttings have taken over her kitchen and home, so she is anxious to begin giving them away as gifts to friends and family. Baby plants ready to be gifted to family and friends. 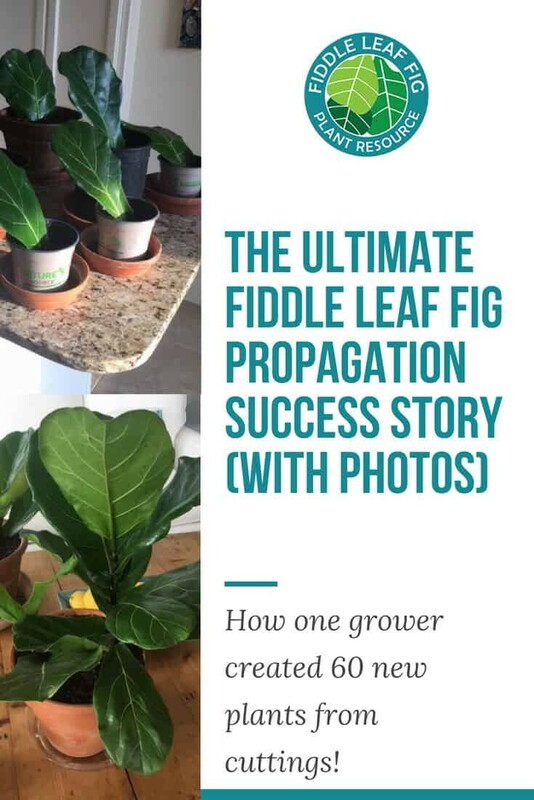 The biggest lesson that Jackye Carroll learned from this process is that propagating a fiddle leaf fig is incredibly easy if you have patience. She was surprised by her success rate and the resilience of her cuttings. Early on in the process, she worried that her cuttings wouldn’t grow, but given enough time, a vast majority have grown into healthy, beautiful new plants! 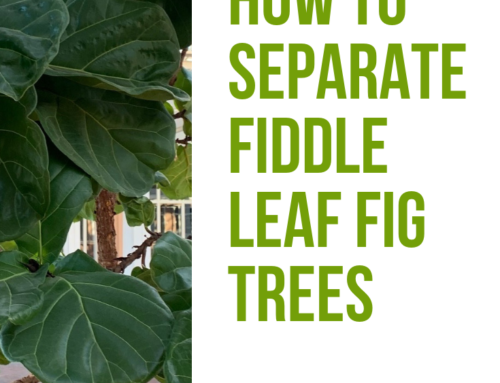 To learn more about how to propagate your fiddle leaf fig plants, read Fiddle Leaf Fig Propagation in 6 Easy Steps and Preparing to Propagate Your Fiddle Leaf Fig. For more on pruning and shaping your fiddle leaf fig, read how to properly Prune and Shape your Fiddle Leaf Fig. 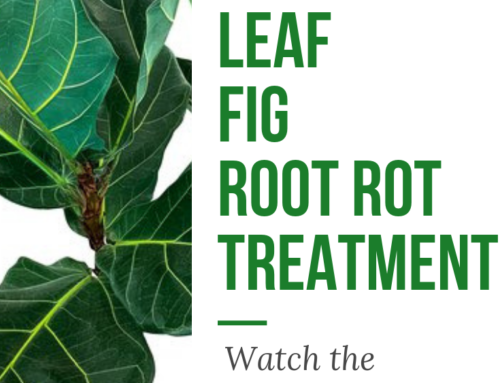 To learn more, sign up for our Fiddle Leaf Fig Care 101 Webinar and get your Fiddle Leaf Fig Plant Food online here. 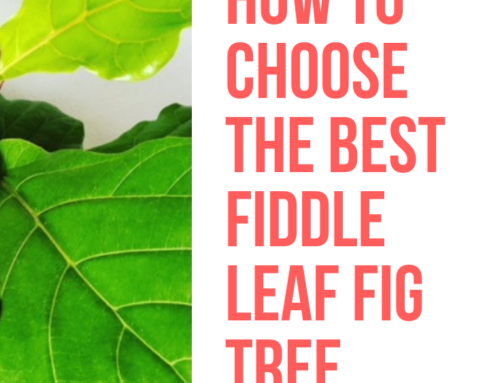 Click to join our community on Facebook: Fiddle Leaf Fig Plant Resource Group. 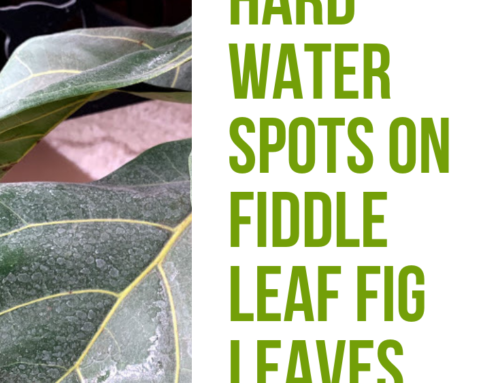 Read The Fiddle Leaf Fig Expert, your complete guide to growing healthy fiddle leaf fig plants. The book is available in full-color paperback or Kindle edition on Amazon now!